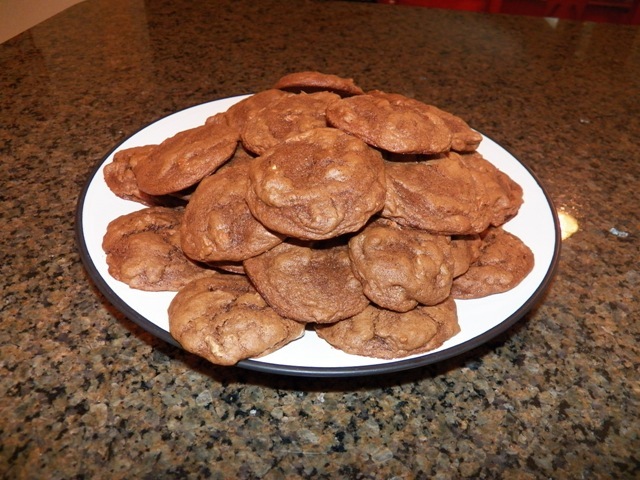 So, I promised some recipes that didn’t use any kind of specialty products, and this one is just so amazing, that I could eat all my points in one day just eating these cookies! 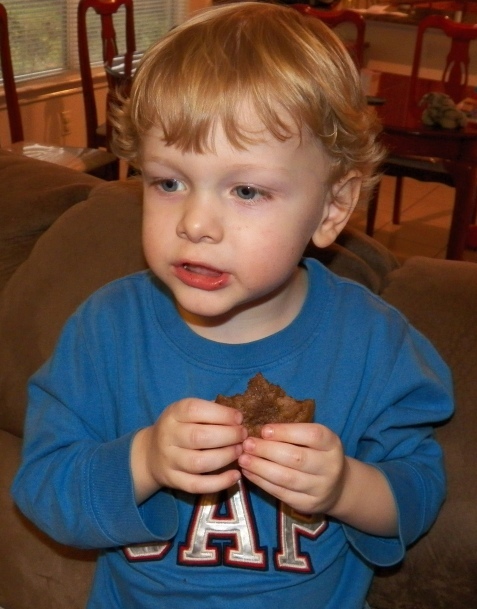 These are a Texas favorite: a heat spike in an otherwise intensely chocolate cookie. Position racks in the top and bottom thirds of the oven; preheat the oven to 350°F. Coat two large cookie sheets with cooking spray. Place the chocolate in a small bowl and microwave on high for 15 seconds. Stir well, then continue microwaving in 15-second increments, stirring after each, until half the chocolate has melted. Remove the bowl from the microwave and continue stirring until the chocolate has fully melted. Set aside to cool for 5 minutes while you begin making the cookie dough. Whisk together the flour, baking soda, salt and cayenne in a medium bowl; set aside. Beat both sugars and the eggs in a large bowl with an electric mixer at medium speed until thick and pale brown, about 5 minutes. Beat in the melted chocolate and vanilla until smooth. Remove the beaters and stir in the flour mixture with a wooden spoon, just until all the flour has been moistened. Stir in the toasted almonds. Drop by rounded teaspoonfuls onto prepared cookie sheets, spacing the mounds about 2 inches apart. Bake in the top and bottom thirds of the oven for 5 minutes. Reverse the cookie sheets top to bottom and back to front, and continue baking until firm and slightly puffed, about 10 minutes. Cool on the cookie sheets for 5 minutes before transferring to a wire rack. 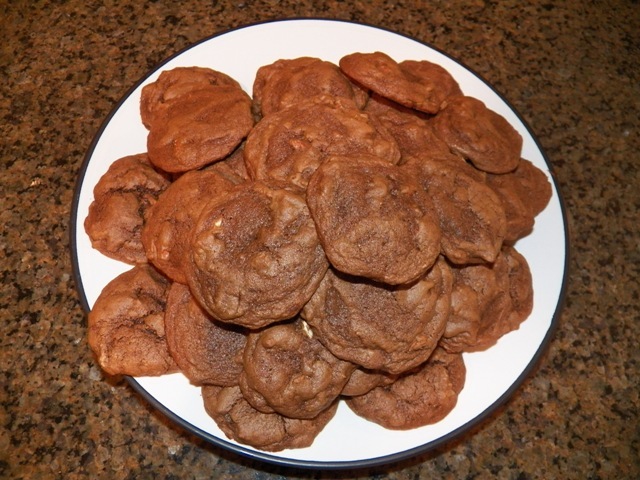 If you need to cook these in several batches, allow the cookie sheets to cool for 5 minutes before spraying them with more cooking spray and making more cookies. Yields 1 cookie per serving, about 38 cookies (I got 39 cookies). 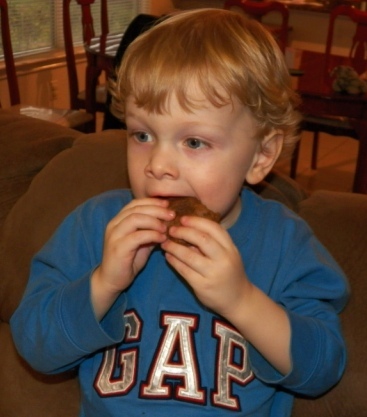 He then proceeded to run into the kitchen and returned with the Ziploc bag of cookies.. Ha! May you enjoy them in your family as much as we do in ours! (*Warning. They DO have some heat/spice to them from the cayenne pepper. It’s not overwhelming, as if it were, a 3-yr old probably wouldn’t scarf them down so fast; but our 3-yr old DOES like spicy popcorn chicken… your mileage may vary and I suggest having some water handy, just in case… 😉 ).